This interesting building was built about 1600, with additions in 1706 that included the frontage with the loggia on the ground floor. The courthouse was used for the inquest into the sinking of the liner Lusitania on Monday May 10th 1915. 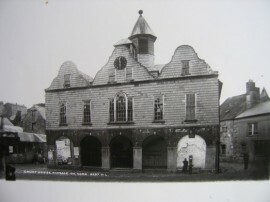 The main structure can be dated back as far as the 1590’s, town records showing its primary function having been that of a market house. Meanwhile,the elegant facade was added in 1703 and is very clearly Northern European in style. One of the features of note is the Venetian window above the entrance, a very rare and unusual example in this country. 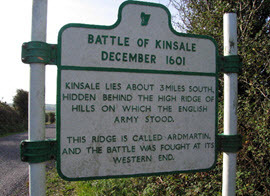 Kinsale received its first royal Charter in 1334, a mark of the town’s commercial as well as strategic importance. Owing to the expansion and increasing prosperity of the town and to the building’s position as a natural focal point, by 1706 it had developed from a simple trading centre into an administrative one. The then mayor and chief justice, Thurston Haddock combined his business under one roof, thus giving rise to one of the building’s more familiar incarnations, that of courthouse. It was here in 1915, that the inquest into the sinking of the RMS Lusitania was held and even today sad reminders of this time echo about the walls.The museum houses a large number of local artifacts relating to Kinsale’s maritime, military and secular history from the Battle of Kinsale to the Kinsale Giant. The idea of housing this Alladin’s cave of material under one roof and of opening it to the public was originated by the famous Kinsale historian Seamas Breathnach who did not live to see the fruits of his work. 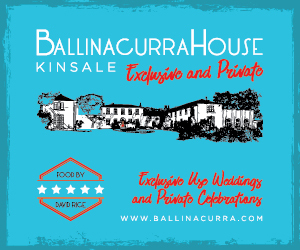 For many years the labour intensive job of restoring and categorising these pieces has been the job of two men, Eugene Gillan and Michael Mulcahy, themselves experts on the history of Kinsale and the surrounding area. Patrick Cotter O’Brien (1760-1806), standing at eight foot and three inches was the tallest man in the world at the time. When he was 18, a travelling showman discovered him working as a bricklayer and brought him to England to star in his “freak of nature” show. He added the stage name “O’Brien” to his own to connect him with the legendary Celtic giants. For nearly a quarter of a century, O’Brien toured the country and in 1785 it was advertised that he was to be “seen by the quality” in a room in James Street, London for the sum of two shillings. Cotter’s “act” was dependent on the element of surprise and so during daylight hours when not performing, he would confine himself to his cramped quarters.It is widely believed that this contributed to the health problems which plagued him throughout his short life. He was known to have frequented Epping Forest by night and their are tales of highwaymen fleeing in terror, having mistaken him in the darkness. The remainder of his life was spent in Bristol and he is there still referred to as the “Bristol Giant”. When he died, he instructed that his body be protected from bodysnatchers and the knives of curious surgeons. His coffin, therefore, born by 14 pallbearers, was lowered into a vault cut 12 feet deep into solid rock and heavy iron bars were cemented into the walls. His giant boots are on display at the museum. 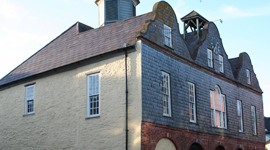 The museum is in possession of a bewildering array of artifacts relating to the town’s maritime history and dating from the earliest of times. In the ground floor rooms, there is an interesting collection of shipwright, barrel,sail and ropemakers’ work, demonstrating the importance of Kinsale’s ship-building industry. Many of the pieces were recovered from the harbour. At one point, Kinsale had three shipyards, and their capability was such ,that in 1612 three of the largest ships in the world were produced there. The famous Dutch East India Company operated out of Kinsale, having it’s headquarters in nearby Innishannon. Outside the building there are amongst other well preserved pieces, a davitt (crane) from the ‘RMS Lusitania’, an anchor from the Spanish Armada’s failed attempt to aide the Irish at the Battle of Kinsale(1601) and also a broken anchor from the 1763 sinking of the ship ‘La Trompeuse’. It was the battle which changed the course of Irish history. The Irish forces were defeated,the nobility fled and the Plantations of Ulster followed,the reprecussions of which are clear from Ireland’s most recent bloody history. 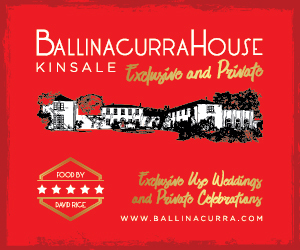 In previous months,troops from Spain led by Don Juan d’Aquila landed in Kinsale despite Irish requests that they land further up the coast. They were surrounded by the crown forces led by Lord Mountjoy.D’Aquila had been promised horses and the support of the whole of Munster but very little of either materialized. In the meantime, ‘Red’Hugh O’Donnell,having summoned his troops and local chiefs to Ballymote in Sligo, embarked on a hard journey on foot across mountains and flooded land to Munster and into Innishannon where he met up with the forces of Hug O’Neill, arriving in Kinsale in late December 1601. Storms and torrential rain foiled Irish plans of a night time attack. A rare occurence of St. Elmo’s Fire,an electric storm,caused many of the horses in the Irish camp to bolt. O’Neill crossed difficult terain with a force of 5000 to attack the English camp, but they were ready for them, dispatching them in a bloody skirmish his troops panicked and many fled. O’Donnell’s forces were similarily routed and they too gave up the ghost. The Spanish surrendered soon after. The battle was over. In all, the English lost as many as 5000 men, mostly through starvaton and disease, but their superior tactics won them a decisive victory. The museum has many artiacts relating to the battle, including maps,a cannon and a belt worn by O’Neill. 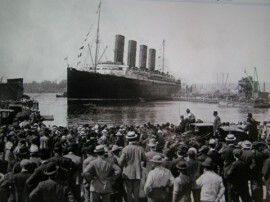 On the 7th of may 1915, the Cunard liner RMS LUSITANIA was sunk off the Old Head of Kinsale on its way from New York to Liverpool. She was torpedoed by the german submarine U20, with the loss of 1,195 out of 1,959 passengers, some of whom are now buried at St. Multose Church in Kinsale. Carrying many important personages, including the wealthy american, Alfred Vanderbilt and the art collector, Hugh Lane, the sinking had the immediate effect of bringing America into WW1 and it is because of this that many conspiracy theories exist,not least that Winston Churchill,then Lord Admiral, had prior knowledge of the impending danger from U-boat attack and may have allowed her to be sacrificed for that very end. The LUSITANIA’s military cargo, a question which provokes heated debate even today, fuels the argument that, militarily speaking, the Germans may have had a right to sink her. For whatever reason,Turner did not follow this direction. It was also discovered that the portholes of the ship had been left open at the time of impact and that this carelessness had caused the Lusitania to flood more quickly. It is widely believed that Captain Turner’s hand in the matter was greatly exaggerated and that he may have been used as a scapegoat. The museum has such a vast and diverse collection that it is difficult to categorize.There are maps of the town and its environs dating back centuries, there are models and paintings of important ships, poignant letters, magnificent carvings, beautiful musical instruments…all of which in their own way, create a fascinating picture of Kinsale through the ages. The collection is a testimony to those who have spent so many years putting it together. The town was issued its first royal charter, granting its recognition and privileges, by Edward lll in 1334. The museum has an important collection of these, ranging from Elizabeth l through to James ll. Kinsale’s handcrafts are also well represented here and there are fine examples of the intricate lacework of the area. There is also a handsome traditional ‘Kinsale Cloak’ on display. Another must-see is the harpoon in one of the upper rooms, rumoured to come from Scott’s expedition to the Antarctic, another event with which the town has its own personal connection.